Please note: you can only enter the site during these hours. No entrance will be granted from outside the site before 8am or after midnight on any day. Those who hold Weekend Passes can enter from 8am on Saturday, and those with Sunday Passes can enter from 8am on Sunday. Access will not be granted prior to this time. .
Wonderfruit is a cashless event. Our RFID wristbands make everyone’s life easier and everyone’s wallet safer. On arrival, present your ticket or confirmation email with your unique reference code and get your RFID wristband activated. Once you’re in, you can load credit onto your wristband at the top-up stations around The Fields using your credit card or cash (there are ATMs on site) and use it to buy all your food and drinks as well as massages, treatments and other great stuff. Should you have any issues with your wristband while roaming The Fields, contact the staff at our Info Tent. If you have any credit left over when you're ready to leave, be sure to get a refund from the top-up stations. Refunds are available on site during designated times only. No refunds will be given after Wonderfruit ends. Find a Google Maps link to the new site here. And here's a map to help you find us. From Chonburi-Pattaya Highway Route 7, take Route 36 east towards Rayong. After approximately 8 km, you will see a large blue sign for “Siam Country Club” on the right hand side; make a U-turn as soon as possible and turn left at the sign. Pass Bira Go-Kart Circuit and at the roundabout, go straight towards “Siam Country Club Waterside” and follow the signs for “Wonderfruit”. Follow appropriate parking signs to Main Entrance, General Camping and Boutique Camping. From Sukhumvit Road Route 3, take the road leading east opposite Na Chom Thian Patrol Police Office (Soi Na Chom Thian 6) towards Wat Huai Yai. After approximately 7 km, turn left before Wat Thepphabut, pass Ban Bueng School, and follow signs for “Wonderfruit”, heading towards “Siam Country Club”. Follow appropriate parking signs to Main Entrance, General Camping and Boutique Camping. We encourage, develop and innovate creative solutions for sustainable living and bring together a global community to celebrate them. We use our platform to catalyze creativity and make a meaningful positive impact. What we’re saying is that we are committed to environmental sustainability, and we recognise that sustainable resolutions to environmental issues can be brought about through a cultural agenda. This gives us not only the opportunity to engage and advocate in this area, but a responsibility to do so. We strive to create a safe and healthy site for our Wonderers and believe we have an obligation to conserve and enhance the natural environment. You can help: please keep The Fields clean by disposing of waste in the recycling bins provided and refrain from bringing any single-use plastic onto our site. Come with an open mind and enjoy yourself. Appreciate and respect all elements in The Fields, including the artwork, the performers and each other. Look out for first aid facilities (located at the Info Tent) and ask if you need medical assistance. Drink plenty of water - staying hydrated is crucial. Bring your own refillable water canister (no single-use plastic). Enjoy our food. There will be a wide range of food options available on site, from sit-down restaurants to street food stalls. Contact the nearest security guard if at any time you feel your safety or anyone else’s safety is threatened. Follow the directions of Wonderfruit staff and security personnel. Keep your dog on a leash, and clean up after them. Separate your trash: recycling bins will be located throughout the site. Participate in interactive shows and activities. Prepare to be searched upon entering The Fields. Know that authorities are stationed around the site for your safety. Be aware that there will be checkpoints for alcohol and drugs. Remove your wristband until the festival has ended. Move, deface or otherwise vandalize the artwork. Bring pets unless you have a pet pass (dogs only, limited numbers). Drop cigarette butts or litter on the ground. Camp in unauthorized locations. There will be several on- and off-site accommodation options available to suit all budgets. Buy bootleg products. You'll find official merchandise for sale on site. Bring food or soft drinks from outside or from the camping areas onto the festival grounds. You will be searched as you exit your campsite to enter the festival grounds, and any food will be confiscated and drinking flasks will be emptied. Bring alcohol from outside into ANY areas including the campsites. Use drugs or other illegal substances. Bring any foam or single-use plastic bottles or cups. Bring any weapons, explosives or other harmful items. Bring any drones onto the site. We don't allow drugs and weapons anywhere in The Fields. Politely cooperate if you are searched (we’re just looking out for you). Try to buy alcohol if you’re a minor. Anyone breaking the Rules of the Land may be asked to leave The Fields. 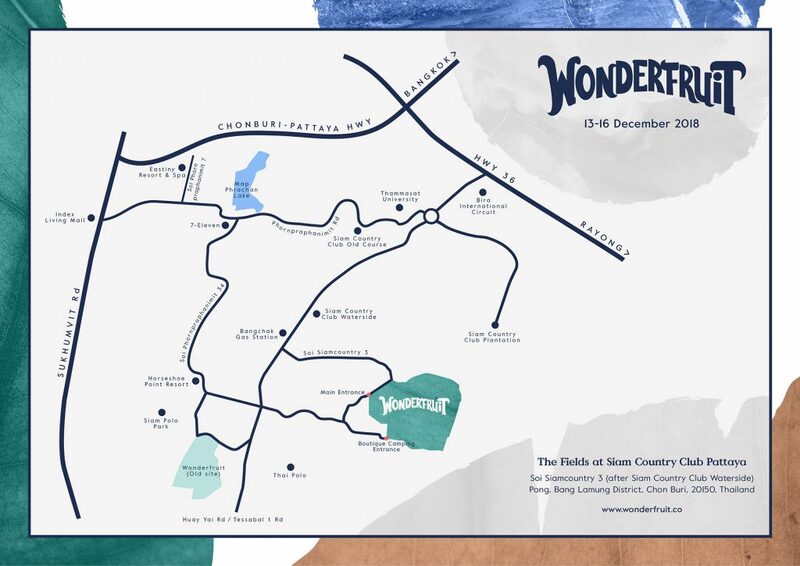 By far the best way to immerse yourself in the full festival experience is to stay on site at Wonderfruit. If you are planning on staying overnight on site in any form (General Camping, RV Parking or Boutique Camping) then you will need to purchase an additional camping ticket. The on-site camping areas are open from 4pm on Thursday 12 December, and all Wonderers are required to leave the site on Monday 16 December. If camping or glamping is not your thing, you can stay with one of our off-site partner hotels or make your own arrangements.